IT's importance in company growth cannot be overstated. The ability to both harness innovation and keep information systems running smoothly is a must-have for your company to reach its potential. Business leaders increasingly understand the need for a bold, hands-on, dedicated partner to excel in this ever-changing and challenging digital world. If this makes sense, it’s time for you to meet Lazorpoint. We take a seat at your table to improve your business processes and solve your technology challenges. Large enough to reimagine your entire technology environment and small enough to be on-demand and tend to the basics, we are the right IT managed services partner for companies that the success of their companies depends on it. "WITH LAZORPOINT'S BROAD AND DEEP EXPERTISE, AND THEIR ABILITY TO QUICKLY UNDERSTAND OUR BUSINESS, WE’VE GREATLY IMPROVED SYSTEM RELIABILITY AND PERFORMANCE." lead your company through the new digital world. We promise that the value you get truly determines the price you pay… because that’s how it should be. 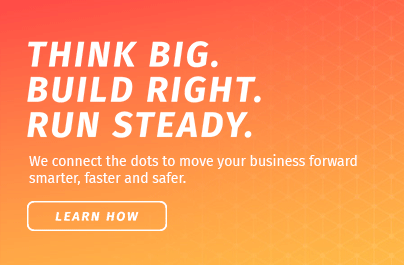 We connect the dots to move your business forward smarter, faster and safer. Want to know how?